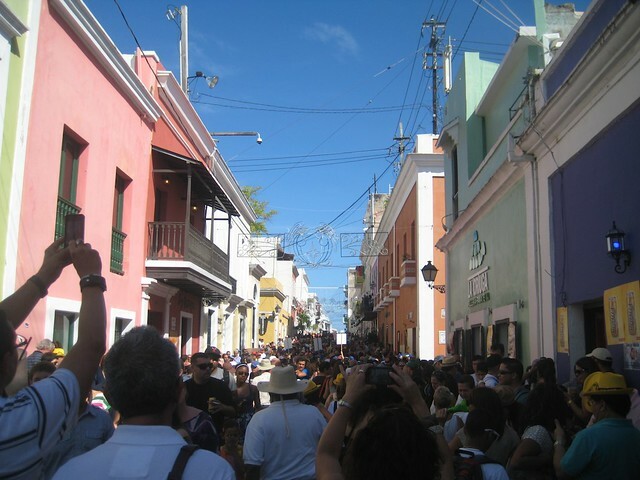 This past weekend, hundreds of thousands of Puerto Ricans and visitors gathered in Old San Juan to celebrate Las Fiestas de la Calle San Sebastian. 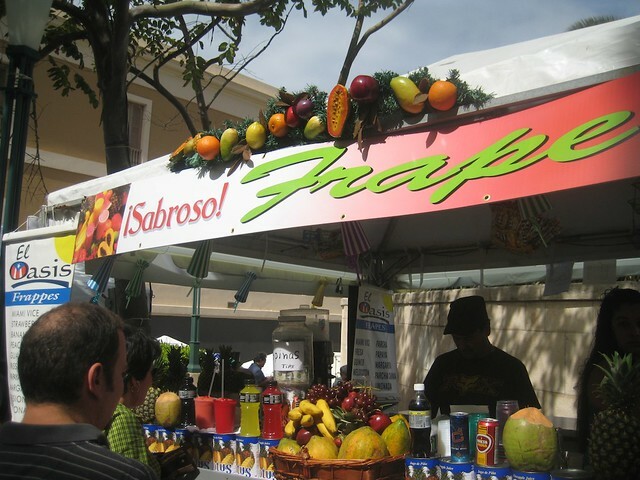 This festival started in the 1950s to commemorate the namesake of the popular street, martyr Saint Sebastian. In the 1960s, it began to incorporate traditional cultural elements like art, music, gastronomy, crafts, and dance. 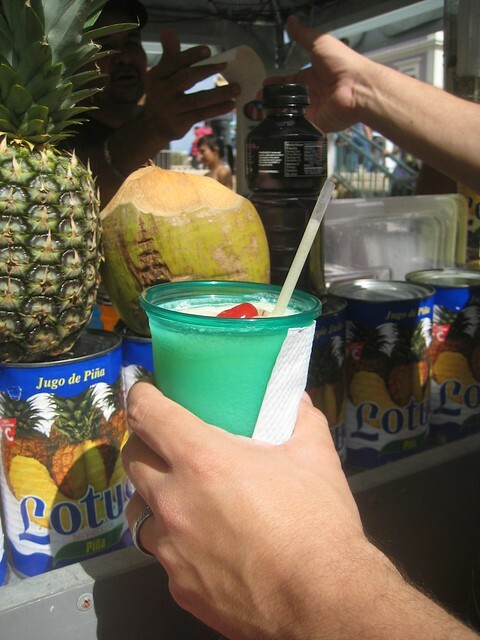 Today, las Fiestas bring together Puerto Ricans from all walks of life and mark the end of the holiday season. 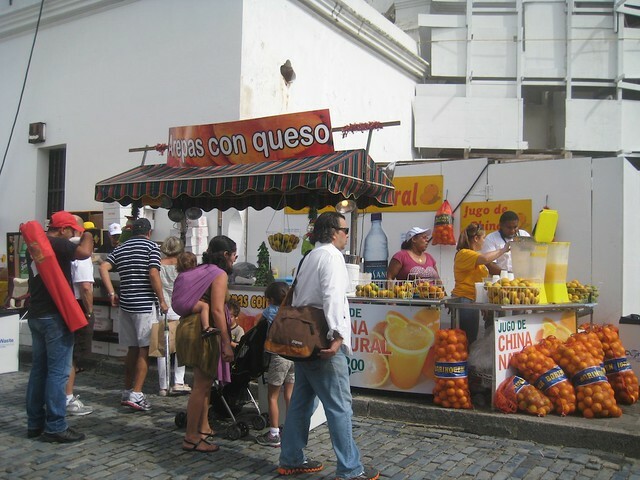 Although the festival’s main drag is restaurant and bar lined San Sebastian Street, its heart during daylight hours is the Cuartel de Ballajá. 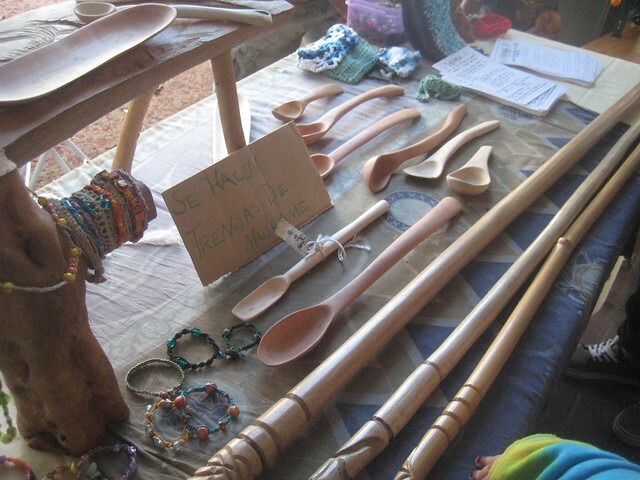 Artisans line up at these historic barracks to sell their crafts. 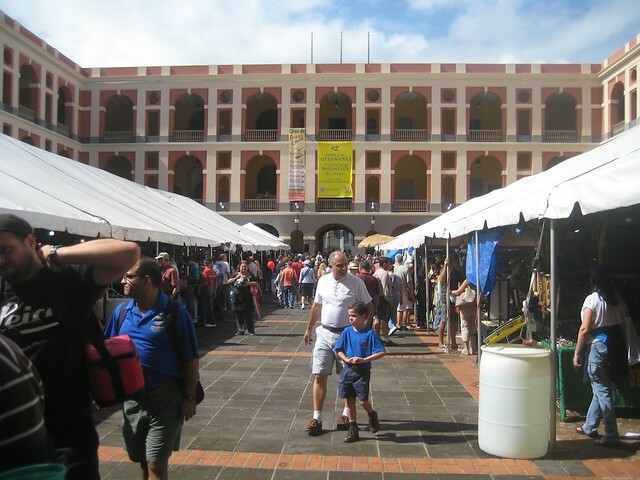 Paintings, prints, wood sculptures and carvings, pottery, and all sorts of handmade goods can be found under two huge tents set up at the Cuartel or along its main corridor. 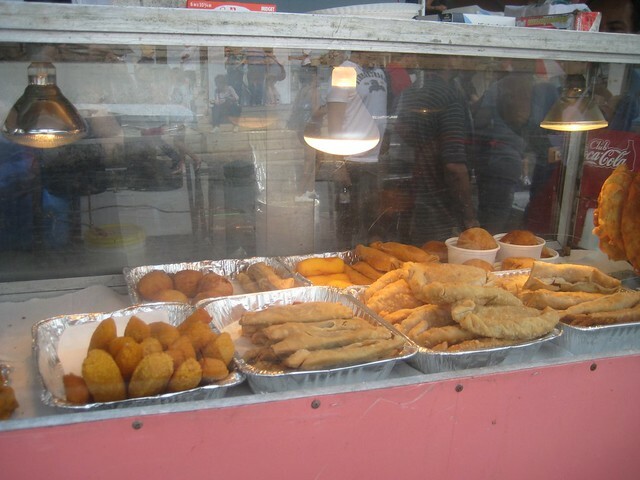 Since this is a food blog, I wanted to highlight some of my favorite food related crafts from the tents. 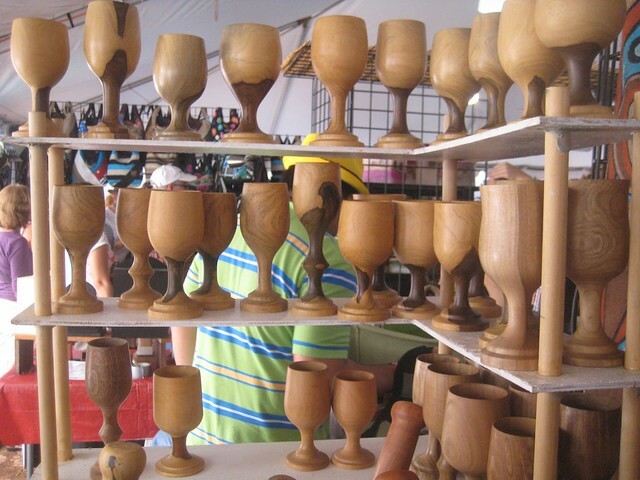 They include pilones (mortars and pestles carved from wood), tostoneras (wooden contraptions to press tostones – fried flattened plantains), mugs, stemware, cooking utensils and candy. In addition to crafts, there were plenty of yummy eats. Remember the tutorial on frituras a couple of months ago? It will come in handy! 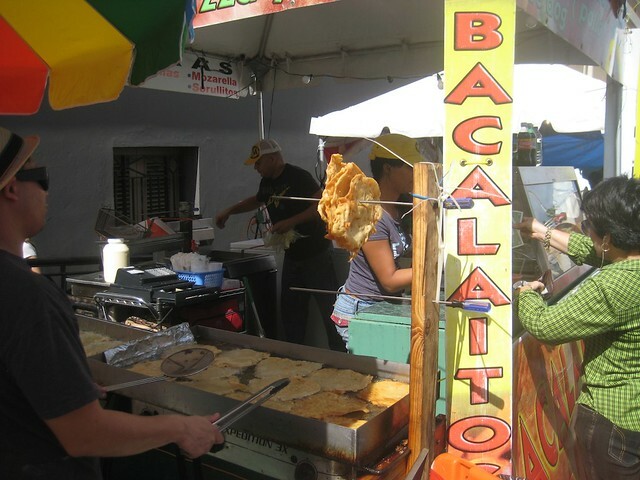 We enjoyed a crabmeat alcapurría and a lime frappe while we browsed and people-watched. 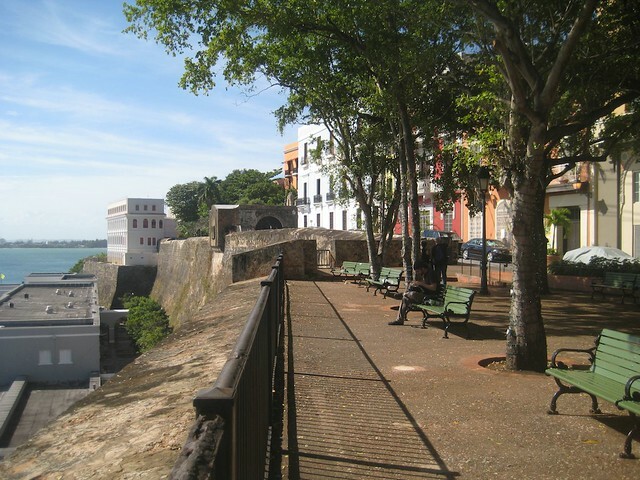 Even though we left the Fiestas early, we took our time getting back to the car, taking in some of the quieter Old San Juan streets. 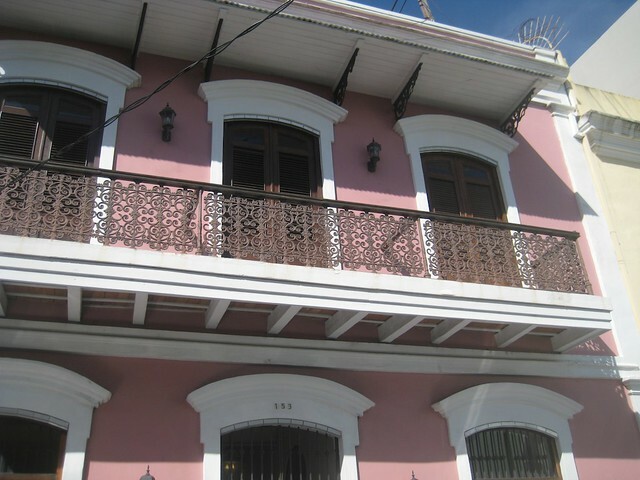 A visit to Café Cuatro Sombras wrapped up our afternoon in the old city. I can’t wait until we get to do it all over again next year on the third weekend of January. If you have any questions about the festival or any of the crafts and foods in this post, leave me a comment! 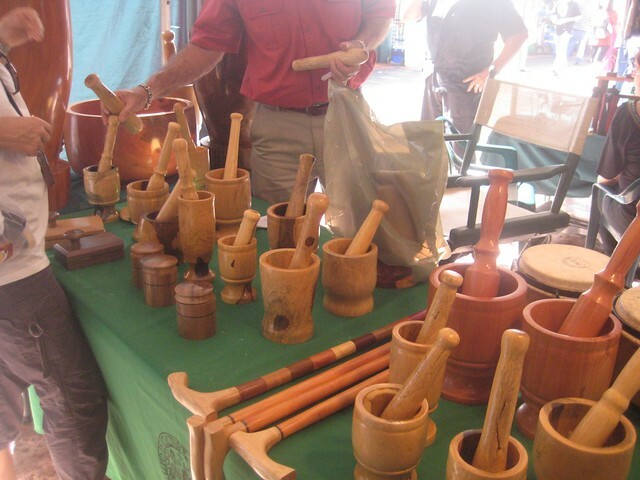 Wow – I’d love to sample my way through this, and buy some gorgeous mortars 🙂 I really want to go visit Puerto Rico sometimes, I have Puerto Rican colleagues who make the best food! What a fun fiesta! Looks nice and warm! The food looks awesome and I want those wooden spoons! I was there on Friday night, it was lots of fun! 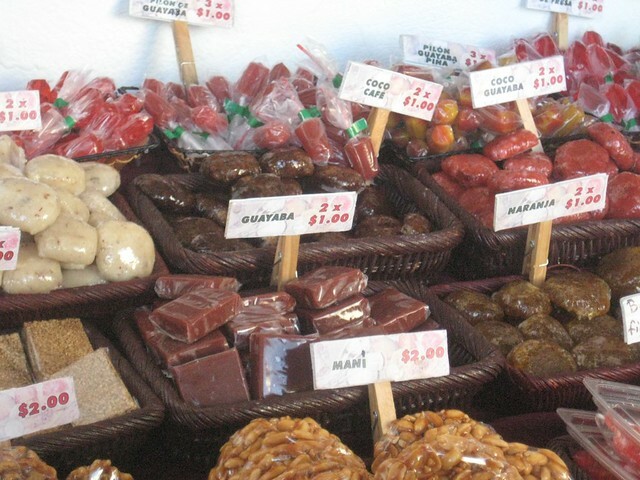 I bought a pincho, then went to Ballajá and got myself a bag of candy (lots of dulce de coco, yummy). Can’t wait either for next year! My favorite part this year was hanging out at the Centro de Estudios Avanzados de Puerto Rico y el Caribe. 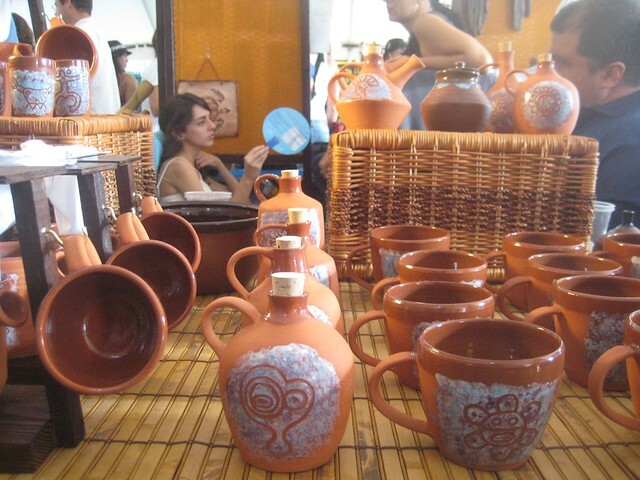 They had a book fair, a coffee stand, and lots of tables around with cooler artesanias. It was so laid back – a little oasis in the middle of the crowds! Ahhh! 🙁 I didn’t get to that part. A new stop for next year, yay! Looks like a sunny and fun day with plenty of good food to try! Lots of nice things to look at and possibly take home- I like that;-) The old town looks beautiful, love the colors of the buildings, such a pretty setting for this event. 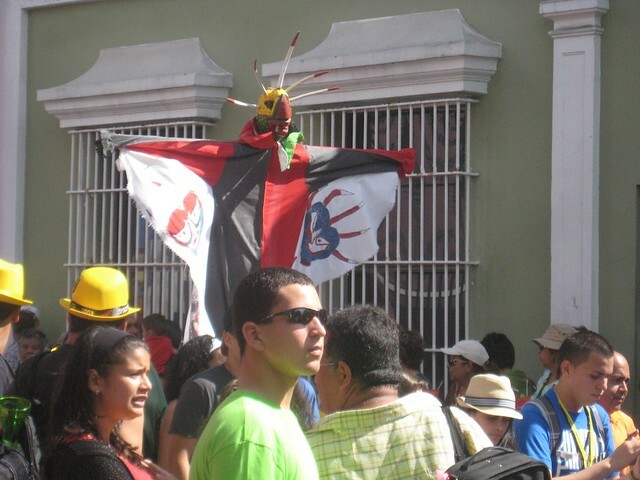 Thanks for a glimpse of this beautiful fiesta in your wonderful country. 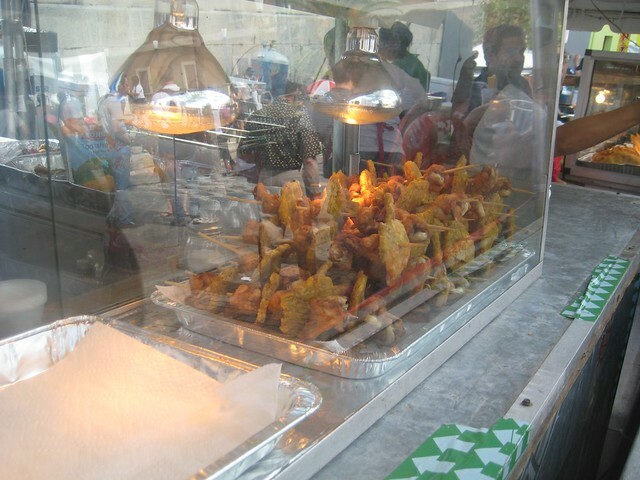 The street food looks amazing! Most of all I love the sunny WARM looking day!! It’s in the 20’s in my neck of the woods. This is such a great post! I love it! And I love the mugs and the jars! They would look great in my kitchen! Saludos! 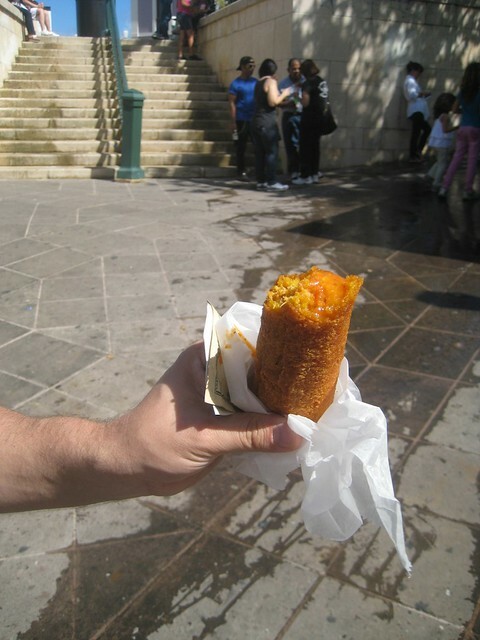 esas eran las arepas que estaba buscando!!!!!!!!!! Les pasé por el lado y no las vi!!!!! Qué rabia me da!! !